The ambition of this Land Art Generator initiative is laudable. While the technology we employ could be used to create electricity (and does so for lighting) we would like, with the competition jury’s permission, to shift the focus. As technology and global thinking shift towards renewable energy production, the UAE finds itself fortunate in its abundance of solar energy. Its natural resources ensure that electricity production will never be a problem. The UAE is burdened by a lack of one resource that is essential to its future growth: fresh water. The UAE currently uses a huge proportion of its electricity consumption (approx. 25%) on the energy intensive process of seawater desalination. With the largest population growth rate in the world and the highest rate of water consumption in the world the UAE’s dependence on desalinated seawater is total. The solution of increasing the production of water and energy indefinitely to meet demand is unsustainable. There must be an alternative solution. We aim to inspire a society to question the processes that support their lifestyle. 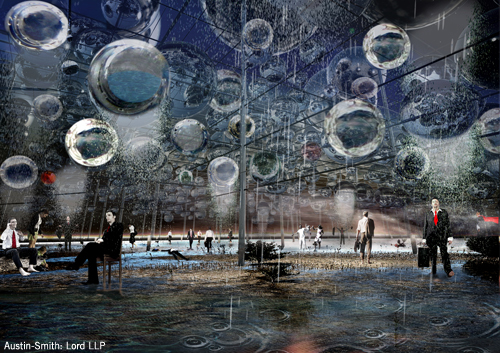 Our proposal is a physical representation of a natural cycle that harnesses solar energy to generate fresh water. By providing low energy alternatives to industrial desalination we can still generate an excess of electricity for the grid. We aim to create an experience at three scales: From the distant surroundings our installation is a sparkling mirage on the horizon, a vaporous form that shimmers by day and de-materialises by night. 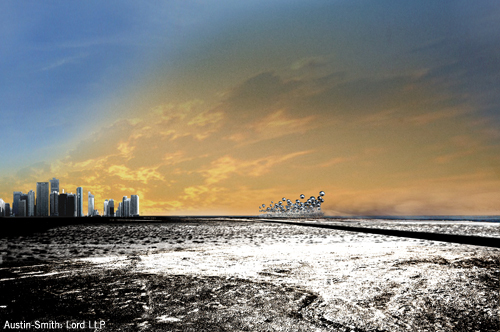 Closer up, at a captured moment between two urbanised landscapes, where desert and city dweller meet, this becomes an encounter with a cloud. 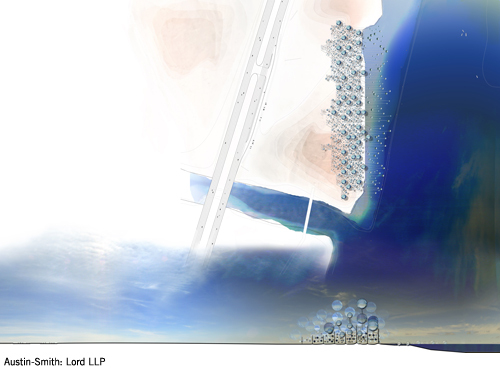 Its language is of a process that connects the sea, sky and ground and produces buoyant water droplets that contrast with the continuous skyline. Within it is not the vision but the atmosphere, the sensation of when water touches the skin, experienced as a rain shower that is triggered each evening by the setting of the sun.